This tutorial follows the progression of a buck converter design from first constructs to a final, parametrized, hierarchical design. Although all schematics and supporting files can be downloaded as you proceed through the tutorial, a zip archive containing all files can be downloaded in the next section. For this tutorial, you need a copy of the schematic and other supporting files as well as a fully licensed version of SIMetrix/SIMPLIS. To request an evaluation license for the full version of SIMetrix/SIMPLIS, visit our Evaluation Page. If you already have SIMetrix/SIMPLIS on your computer, verify that you have at least version 8.00d. 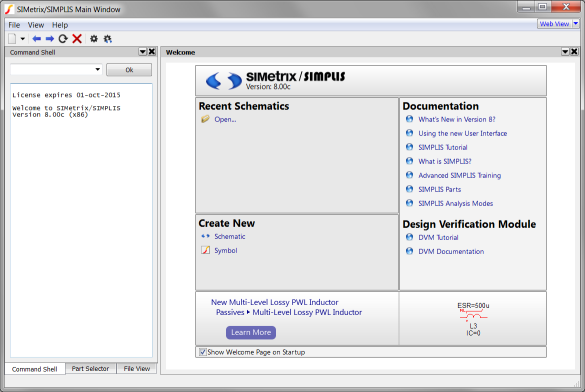 To identify the version of your installation, select Help > About... from the menu bar; a dialog opens and displays the current SIMetrix/SIMPLIS version. To update to the most recent version, select Help > Check for Updates... from the menu bar. To download a zip file which includes all schematics used in this tutorial, click simplis_tutorial_examples.zip. To request an evaluation license for the full version of SIMetrix/SIMPLIS, visit our Evaluation Page. SIMPLIS welcomes your feedback (positive, negative, bugs, etc.) regarding this tutorial. To send comments, click here. 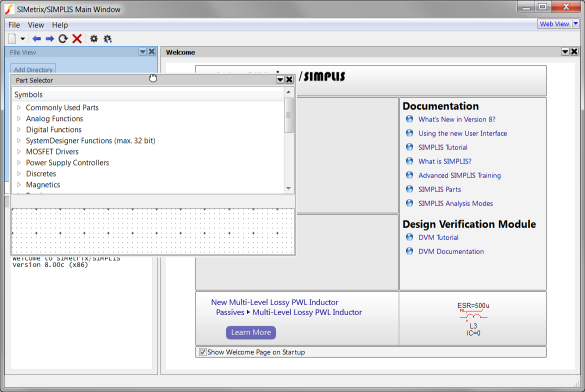 The SIMPLIS tutorial is intended to help new users get started with the SIMPLIS simulator and to serve as a general reference for SIMPLIS. If you are an experienced user, continue in this topic and follow the steps to set up the user interface for the rest of the tutorial; after completing this topic, feel free to skip ahead by clicking links in the left panel or by using the search box to find a keyword. Topics with subsections include a mini table of contents at the top of the page. At the end of each section is a back-to-top link that you can use to return to the table of contents. The ⇦Previous topic goes to the previous topic. The ⇨ Next topic goes to the next topic. The ⇧ Parent topic goes to the main section topic; that is 1.0, 2.0, etc. Screen shots of schematics have the layout grid turned off for readability. The Hide grid option is off by default. Leaving the grid visible as you work can help you place symbols and wire them together on the schematic. The Schematic editor menu View > Toggle Grid turns on and off the grid. The SIMetrix Simulator is an optimized SPICE simulator with excellent convergence. The SIMPLIS Simulator, the one used in this tutorial, is a Piecewise-Linear (PWL) simulator optimized for switching power supply design. 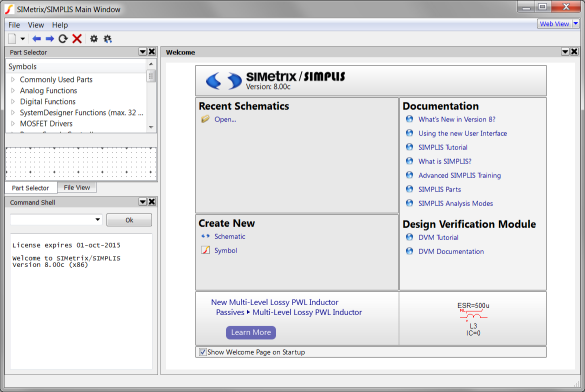 Beginning with SIMetrix/SIMPLIS version 8.0, SIMetrix/SIMPLIS has an integrated user interface with a single Main Window and a set of sub windows called System Windows which can be moved or docked on the periphery of the main window. The Welcome Page contains links to open recently used files, to access the documentation system, etc. 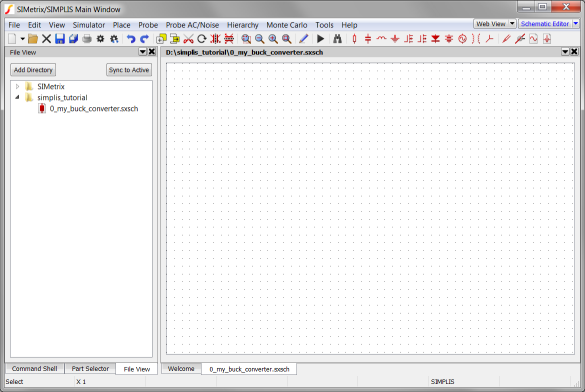 The Schematic Editor window allows you to edit schematics. The Waveform Viewer window opens to display output curves after you have run a simulation. 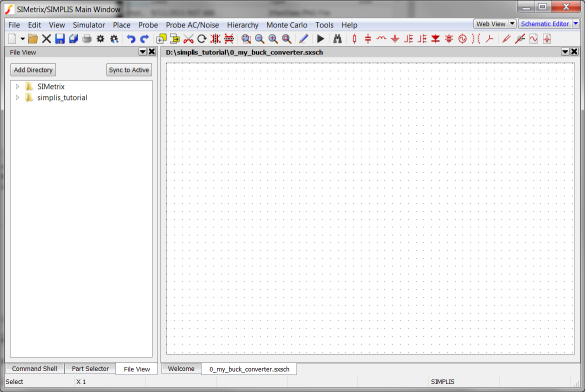 The Symbol editor window is where you use to create or modify symbols. The Command Shell displays error messages. Note: In the full versions of SIMetrix/SIMPLIS, the Command Shell includes a text field for entering script commands. The Part Selector is where you find symbols to place on a schematic. The part selector is populated with symbols based on the simulator mode of the schematic (SIMetrix or SIMPLIS). The File View allows easy access to your file system for opening files in SIMetrix/SIMPLIS. You can add your commonly used directories to the file viewer. Finally, when a SIMPLIS simulation is launched, the SIMPLIS Status shows the progress of the current SIMPLIS simulation. SIMPLIS comes with default options that affect various aspects of how you work. For the purpose of this tutorial, you need to change the simulator mode so each new schematic will use the SIMPLIS simulator. 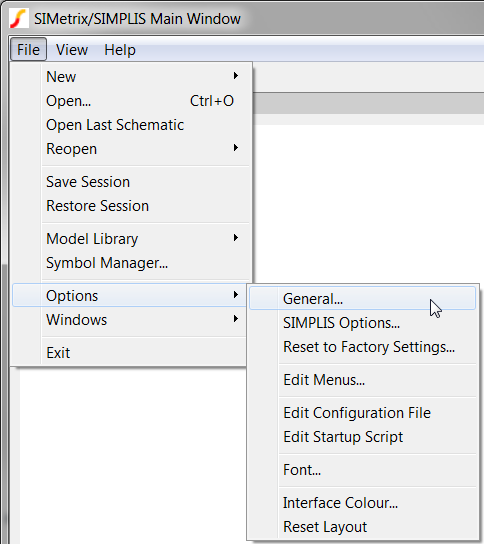 You control all options through the SIMetrix/SIMPLIS Main Window menus or toolbar buttons. Start up SIMetrix/SIMPLIS from the Start menu. Result: The SIMetrix/SIMPLIS Main Window opens. 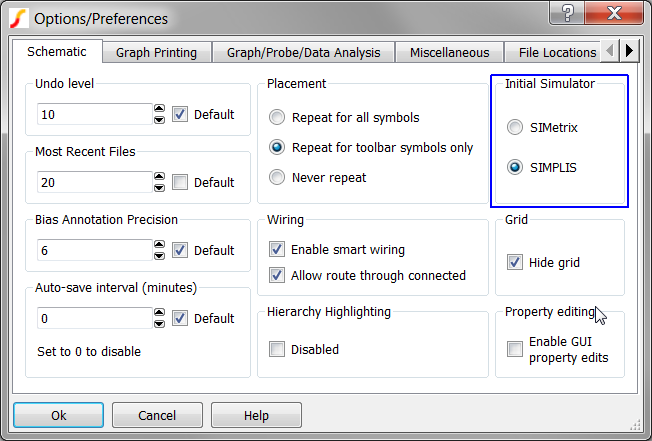 Result: The Options/Preferences dialog box opens showing the Schematic tab. Go to the Initial Simulator section in the upper-right corner, and click the SIMPLIS radio button. Result: Your simulator preference has been saved to your user profile and will persist after you close SIMetrix/SIMPLIS. You may have also noticed the Welcome Page was refreshed after you clicked Ok on the dialog. In particular, the icon at the top of the page changed from the SIMetrix icon to the SIMPLIS icon. In the Create New section of the Welcome Page, the icon next to the Schematic link also changed to a SIMPLIS icon, indicating that each new schematic created will use the SIMPLIS simulator. 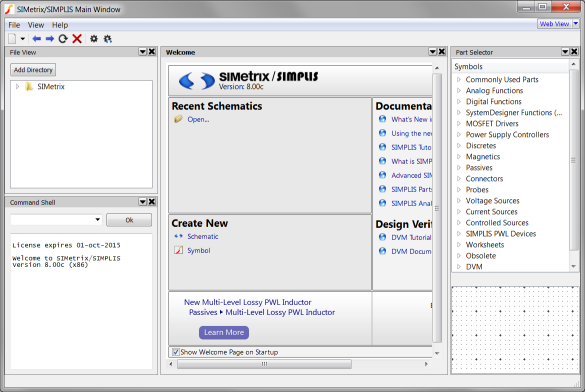 The default SIMetrix/SIMPLIS configuration has the part selector system window hidden. In this tutorial, you will place symbols from the part selector, so you need to make the Part Selector visible before you start placing symbols. To show the Part Selector, select the View > Show Part Selector menu. Result: The Part Selector system window appears on the right side of the main window. Move the mouse cursor to the gray bar at the top of the Part Selector system window. Result: The mouse cursor changes from a pointer to a open hand. Result: The open hand closes and the Part Selector system window is ready to be moved. Release the mouse button to place the Part Selector system window on the File View system window. Repeat the process for the Command Shell system window, dragging it to the other two system widgets. Result: All three system windows are tabbed together in a single window. This system window configuration will be used for the rest of the tutorial. On the Welcome Page, in the Create New section, click Schematic. Result: A new schematic opens. Check the lower right corner to verify that the mode is SIMPLIS. Navigate to a convenient location to use as a working directory where you can save the schematics that you create in this tutorial. In the tutorial text, the directory used will be D:\SIMPLIS Tutorial. Click on the File View tab in the system window. Result: The File View system window comes into focus. Click on the Add Directory button. Result: A directory browser window opens to the current directory. Result: The directory is added to the File View system window. To see the contents of any directory in the File View, simply double click on the directory. Result: The directory contents are displayed with the 0_my_buck_converter schematic being the only schematic file in the directory.